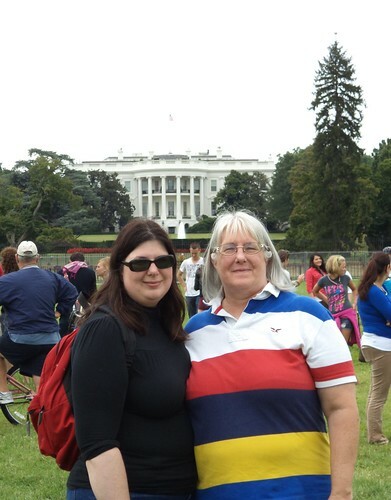 Before heading to Virginia, Carole suggested we should go to Washington DC and meet up with Phil. Phil is her best friend from high school. He's now a not so highly paid grunt lawyer working for the Department of Justice. It's nothing like a lawyer on TV. He does a lot of research for cases. It's low profile but someone has to do it. Besides meeting Phil, what did I want to do? Well, if I'm going to be in DC, I want to see those things I see on TV all the time, things like the Capitol building, the White House and the Lincoln Memorial. Carole said, "That's a lot of walking, mom." I looked on a map and while it was a lot of distance to cover, it really didn't look that bad. 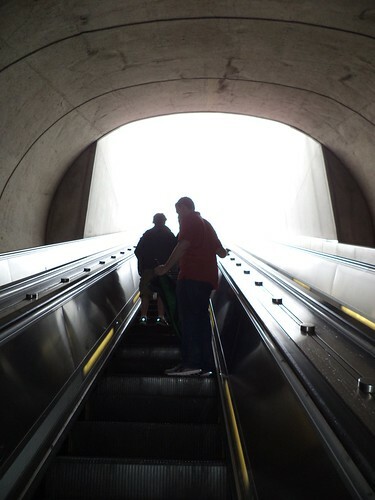 So, we met Phil at the Capitol South DC Metro station and headed up. and up...and up. It's a tall escalator. After lunch at a nearby, (really nearby, like across the street) restaurant, we headed towards the Mall. 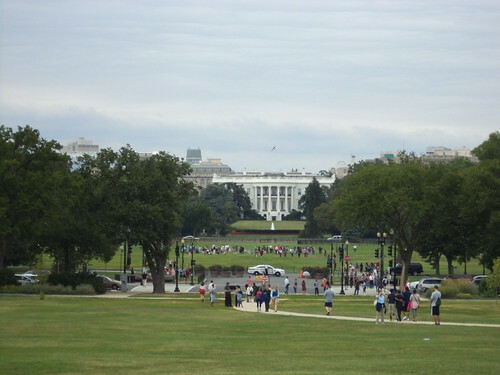 If you've never been to DC, let me explain what the Mall is. It's like a giant park for the nation. It stretches from the Capitol building, west to the Lincoln Memorial, with a north branch to the White House. The Washington Monument is sort of in the middle of this space. Around it, are all the national museums, from the Smithsonian Air and Space Museum to the National Portrait Gallery and a whole lot of other places along the way. Near the Lincoln Memorial are the other memorials to the people who fought in various wars from World War I through the Vietnam Memorial. You can see the Jefferson Memorial from the World War II memorial but it's not something you can walk to from there. It was raining when we started walking. Up ahead is the Rayburn Building, where the representatives from Illinois have their offices. It's named for Sam Rayburn, who served as Speaker of the US House of Representatives for 17 years. Beyond this is the National Botanical Gardens. Across the street from it was a lovely garden with a fountain. When it's not raining, this area has carts with food and places to sit and eat. The garden contains outdoor as well as indoor gardens. 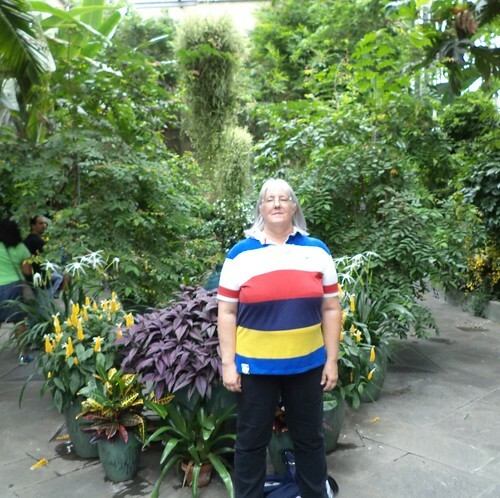 It's free to enter and contains rooms with tropical, arid, jungle and temperate plants. 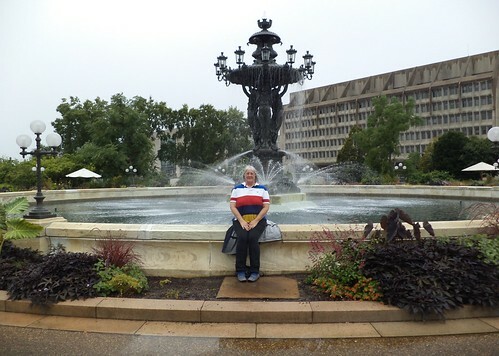 Carole said it's one of her favorite places to go in DC. 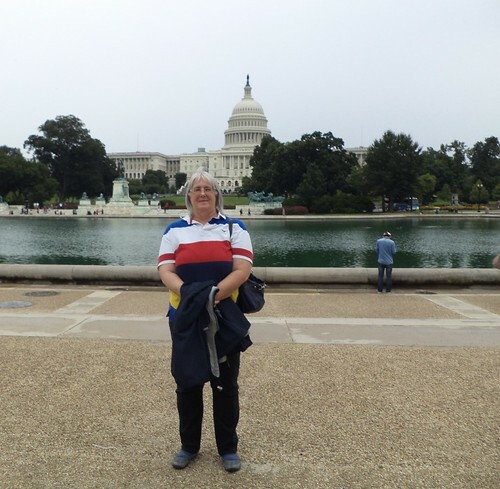 From here, we walked across the street to the reflecting pool west of the Capitol building. It's huge. 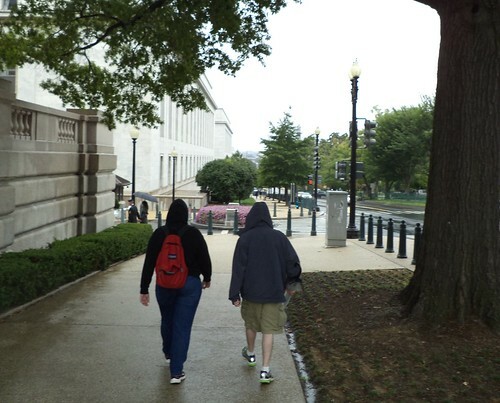 We didn't go right up to the Capitol as we had a lot of walking ahead of us. I didn't know that no building in Washington DC is allowed to be taller than the Capitol. It's the law. From here, we started walking west along the mall. I'll have another post on the things I saw there. At the time we were there, a number of frisbee football games were going on as well as soccer matches. I thought the walking paths on either side of the grassy sections were concrete, when I looked at them from Google maps. They aren't. They are crushed, hard packed stone. It makes for an easier walking experience. With the length of the mall, you can really see the curvature of the earth. Plus, the relative height of the Washington Monument isn't very apparent until you get right down to it. It was always in view and then, suddenly, it's here and it's tall. The scaffolding surrounding it is there to help with the repair work following the August 2011 earthquake. We thought it would look really cool if they made it look like transparent Lego Blocks. 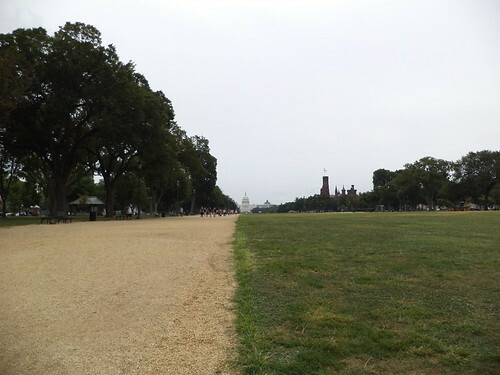 It is a full mile to walk from the Capitol to the Washington Monument. Back in my salad days, I used to walk 3.5 miles a day. We got here and I told the kids I had to sit. 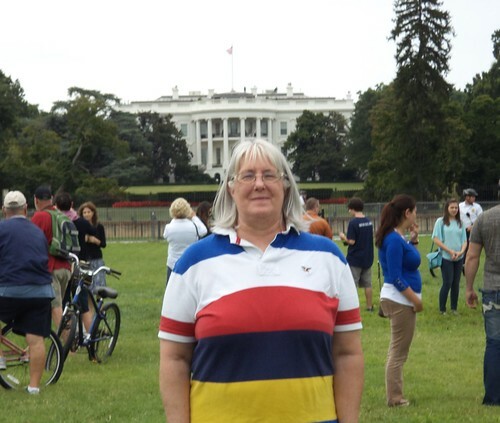 I wasn't really sore, but I knew I needed to rest because we still had the White House to walk to and, from there, on to the Lincoln Memorial. Carole and Phil got caught up on things while I posed and then sat down to rest. That blue crane you see in the upper left is on a construction site for the new National African American Museum slated to open in 2014. Phil knew the names of all the buildings along this section of the mall. I realize he works here, but I don't always remember the names of some of the prominent buildings of Chicago's skyline. After a 10 minute rest, we started on towards the White House. You know what? It looks bigger on TV. This is not the side the helicopter tries to take off from in "Independence Day". That's the other side. Yes, I asked that. Phil was amused and Carole just shook her head. 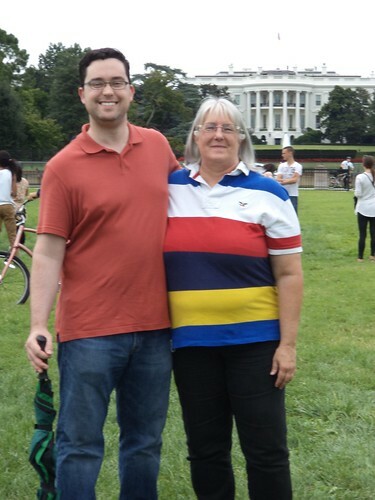 "Yes, my mom is a nerd." While we were there, security patrols moved us way from the iron fence that is up against the street that runs in front of the building on this side. They wouldn't say what was going on; they probably couldn't; but we guessed that President Obama was due back in town from his vacation. We had to move back 100 feet. This particular area is a very large grassy section that had goose droppings on it. You had to watch where you walked. Onward to the Lincoln Memorial. We crossed the street again and started walking. We'd gone, probably 2 to 3 blocks and I realized I had come to the end of what I could really do. 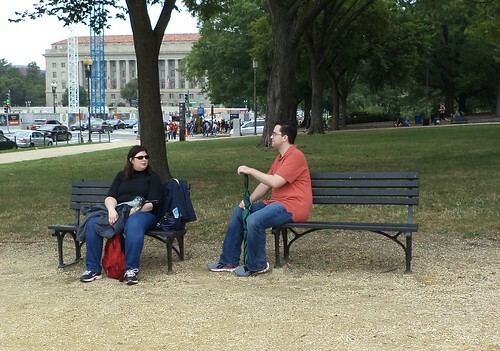 We got to the World War II memorial and had to find benches to sit on. The Lincoln Memorial was tantalizingly near. I was not to see it up close, however. It was just too far for me to walk and we had to walk back to the Metro station to catch the train to the car. 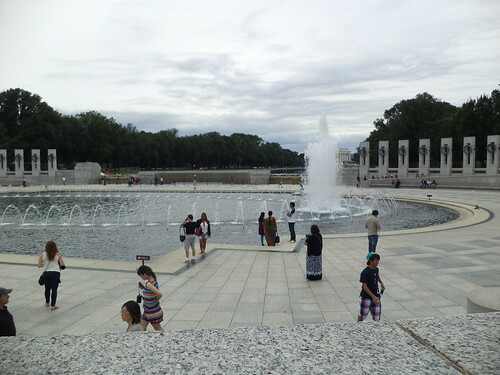 There was repair work going on where the reflecting pool meets the World War II memorial so the reflecting pool's water was very low. After a 20 minute rest, we headed to the Metro. 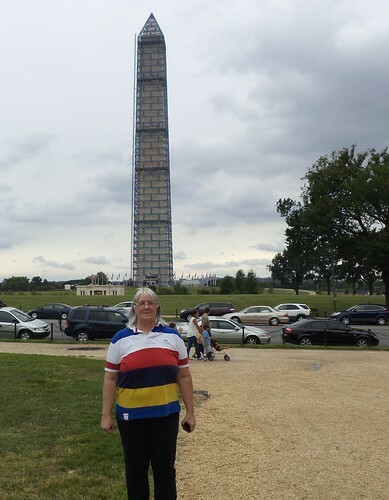 I had walked from beyond the Capitol to the Washington Monument. 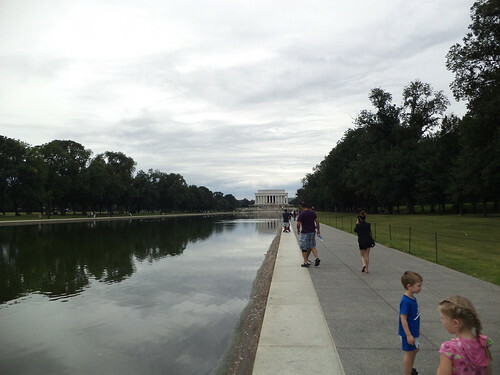 From the Washington Monument, we walked to the White House and then to the World War II memorial. And the last leg was back past the monument to the Metro station. I have to say, I was astonished at my stamina and how long I lasted. I got to see most of the buildings I've seen on TV. It was overcast and the early morning rain kept the crowds, which I'm told can be large, away. It also kept the Mid-Atlantic heat at bay. I know, had it been a typical August Sunday in Virginia, I would not have been able to walk half as far simply because of the heat and humidity. All-in-all, I probably walked close to 3 miles. I was ever so happy to be able to sit down on the Metro and to elevate my legs on the car ride back to Carole's. The best parts were seeing Phil, spending time with Carole and getting proof that I really was there. Now I have to go back so I can tour the museums that line the Mall. I love visiting DC. Glad you got to see it before the shutdown!